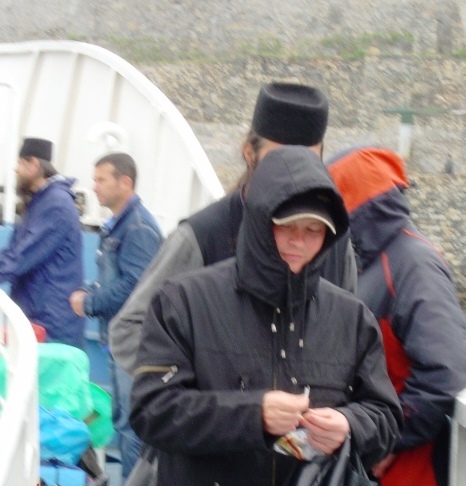 It is 13 or 14 years since I last visited Mount Athos. It was Easter Week 2004, and I stayed for a few days at the Monastery of Vatopedi that week. In 1749, When the Athonite Academy near Vatopedi was estab lished in 1749, the monastic community took a leading role in the Greek Enlightenment movement of the 18th century. I took part in the Good Friday commemorations in Thessaloniki last night, and today, as part of this Easter retreat and pilgrimage, I am going back to Mount Athos for a short journey, before returning to Thessaloniki to join the Easter celebrations. The day begins with an early pick up from my hotel in Thessaloniki at 7 a.m. and a bus journey to Ormos Panagias, north-east of the Sithonia peninsula in Chalkidiki. From there we will continue our journey, sailing towards the south of the Athos Peninsula, until we reach the southern limit, where the highest point is 2,033 metres. We then continue sailing north, along the west coast, with time to see this mysterious and miraculous place. Mount Athos is commonly referred known to Greeks as the Holy Mountain (Ἅγιον Ὄρος) and it forms its own autonomous Athonite State (Αθωνική Πολιτεία, Athoniki Politia) within the boundaries of Greece. 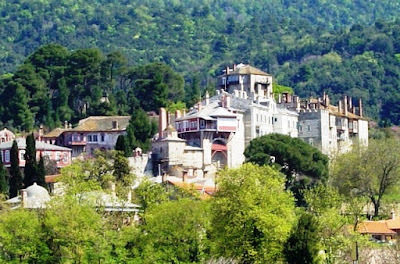 With its 20 monasteries and 12 sketes under the direct jurisdiction of the Ecumenical Patriarch of Constantinople, Mount Athos for centuries has been the centre of Orthodoxy. Many of the monasteries are known for their opposition to ecumenism. The monastery at Esphigmenous is particularly outspoken in this respect, having raised black flags to protest against a meeting of Patriarch Athenagoras I of Constantinople and Pope Paul VI in 1972. Esphigmenous was later expelled from the representative bodies of the Athonite Community. The conflict escalated in 2002 with Patriarch Bartholomew I of Constantinople declaring the monks of Esphigmenous an illegal brotherhood and ordering their eviction; the monks refused to be evicted, and the Patriarch ordered a new brotherhood to replace them. Even Orthodox visitors find anything but a warm welcome at Esphigmenous, where daring monks have hung out a banner from the battlements greeting visitors with the slogan Ορθοδοξία ή Θάνατος, ‘Orthodoxy or Death’. On the other hand, Vatopedi, where I have stayed, is the most welcoming monastery on Mount Athos. Once described by Osbert Lancaster as ‘the Christ Church of Athos,’ Vatopedi is like an intimate, hospitable Greek village with its cobbled courtyard, cascading buildings, hanging balconies and gently ageing bell-towers and fountains. All visitors to Mount Athos need a special permit known as a διαμονητήριον (diamoneterion), similar to a visa. The Holy Mountain is forbidden to women and children. We are not getting off at any of the monastic piers or visiting any of the monastic sites, and for the women on board this is the closest they will ever get to the monasteries. Mount Athos is on Unesco’s list of world heritage sites. The architecture and layout of the monasteries and their schools of icon-writing and painting have influenced art and architecture throughout the Orthodox world, from Greece and Cyprus to Romania and Russia. Over 2,000 monks from Greece and many other countries, including Romania, Moldova, Georgia, Bulgaria, Serbia and Russia, live ascetic lives on the Holy Mountain, in secluded isolation from the rest of the world. Today’s boat journey lasts about four hours and later we stop in the village of Ouranoupoli for free time or to eat. Back in Ormos Panagias, the bus will take us back to the hotel in Thessaloniki late in the afternoon, in time for this evening’s Easter celebrations.